The Restaurant Business – The Ultimate One Day Course covers all the key building blocks for launching and running a successful restaurant business. The cost for the one day course is £495. I’ve been working with start-ups for more than 14 years. I’m passionate about food, wine and hospitality and have done both the 12 Week Certificate Course at Ballymaloe and passed my WSET Advanced Wine exams. I’m disappointed by what other courses are out there on the market to help new hospitality entrepreneurs succeed. The recent BBC2’s Million Pound Menu just reinforced how badly prepared many of the restaurateurs were. My own experience has taught me that courses can be dull. Attention can wander quite quickly. We search for the seat at the back or at least somewhere with a decent view out the window. My clear challenge was to design a course that was exciting, practical and that made a real difference to you. Whilst I’m passionate about hospitality I’m humble enough to realise that I don’t know it all. So, working with Sam Harrison an experienced restaurateur who is about to open his third restaurant, Sam’s Riverside in Hammersmith, we set out to design The Restaurant Business – The Ultimate One Day Course. We think we’ve succeeded! In order to make it really immersive, we’ve used ‘leading edge’ teaching techniques like Virtual Reality, on line questionnaires, gamification, video etc. You will also go away with a comprehensive 80+page workbook full of advice and support that will help you on your journey! The course will take place at Quo Vadis, in Central London. It will start at 08.30 and finish at 18.00. There will be up to 16 participants on each course. You will need to fill out a pre-course questionnaire so we can tailor the course to your specific needs. 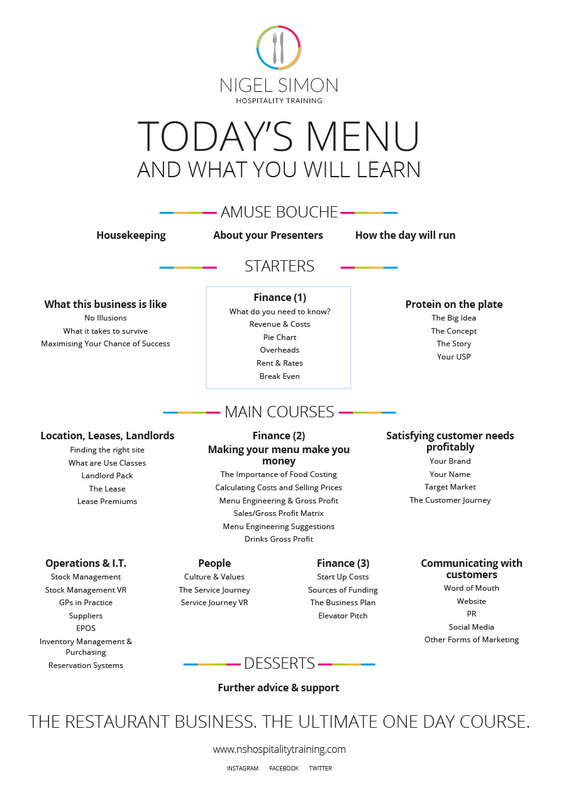 The Restaurant Business – The Ultimate One Day Course will cost £495 which includes all refreshments and lunch, a 80 page Workbook packed with valuable information to take away, and a goodie bag!